Tate is your space to explore, play and see some great art. What if the whole of Tate was a playground? Come and whiz through some of our playgrounds and re-think what a playground can be! 1. What fun feels like! What does playing in a playground make you feel like? The artist Wassily Kandinsky believed that colours, lines and shapes affect our feelings and emotions in the same way that music can. You know how a slow sad song makes you feel down and a pop song with a happy, fast beat makes you want to dance? Well Kandinsky believed that creating a painting is like composing music. ‘Colour is the keyboard, the eyes are the hammers, the soul is the piano with many strings. The artist is the hand which plays, touching one key or another, to cause vibrations in the soul’. Have a go at using bright colours, dynamic shapes and lines shooting into the air to express your whizzing, climbing, running, dizzying playground experiences! Don't you love this photograph of people having fun on a ride? It was taken by Wolfgang Suschitzky, who was born in Austria but moved to London in the 1930s. He took lots of photographs documenting the lives of ordinary people living in London. But although this photograph is of ordinary people, it’s an extraordinary picture. By carefully choosing where to stand to take the photograph he captures the dynamic flying-through-the-air movement of the ride and the exhilaration of the people enjoying it. This playground is not where you might expect a playground to be. Can you guess where it is? If I tell you it’s an artwork, this might give you a clue. Yes that’s right – it’s in an art gallery! In 1971 artist Robert Morris was invited to create an artwork for Tate. The work he made, (and you may have to take a deep breath before reading the title! ), was called Bodyspacemotionthings. It was the first work of art shown at Tate that you could play on. You’re usually not supposed to touch artworks in galleries (as they are too fragile) but people were encouraged to climb, balance, crawl and roll on the huge ramps, tunnels, platforms and beams made by the artist for this installation. Image of Carsten Höller’s Test Site, part of the Unilever Series at Tate Modern. Carsten Höller, Test Site, © Tate Photography. Here’s another playground artwork. It was an installation by artist Carsten Holler at Tate Modern. Every year an artist is invited by Tate to make an installation for the huge Turbine Hall at Tate Modern. (The Turbine Hall is the massive room at the heart of the building where all the machinery was when the building was a power station – before it became Tate Modern). Lots of artists make art for specific spaces (this is called site-specific art), but it’s quite tricky to think of an artwork that can fill such a huge space. What would you make? 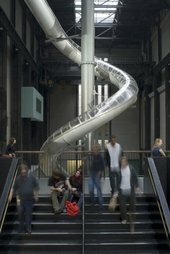 Rather than seeing the space as a problem Carsten Holler used its massiveness, creating mega-slides that went between the different floors. People could go on the slides and whiz down right through the Turbine Hall. Not all playgrounds have to be spectacular (or involve big scary rides). This painting is of a very different kind of playground…a DIY one. These children are using the street as their playground and seem to be having just as much fun. All sorts of activities are happening. Cricket, piggyback riding, music-making…and what seems to be a mass skipping game. Could you make a similar scene with your friends in the park or school playground? Quiz: Which Moustache Should You Have?